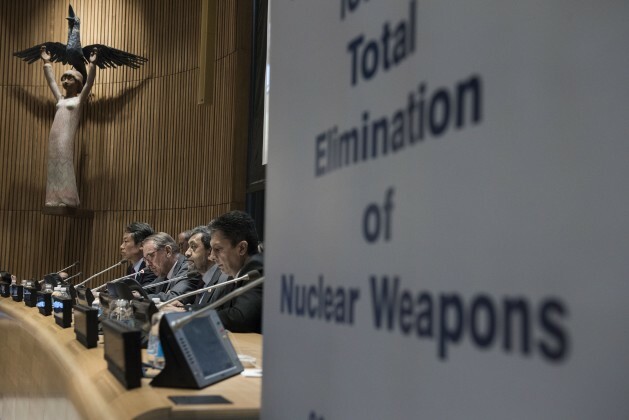 UN member states pushing to ban nuclear weapons have found a greater impetus to unity and a bigger threat following US President Donald Trump pre-empted their agreement by proposing to expand the United States nuclear arsenal. 123 of the UN’s 193 member states supported the General Assembly resolution which initiated the conference. Notable votes against the resolution included: France, Germany, Israel, Japan, Russia, the United Kingdom and the United States. Aside from China, which abstained, the no votes included all of the countries permitted to possess nuclear weapons under the current UN non-proliferation treaty which was adopted in 1968. The 1968 treaty bans all UN member states except China, France, Russia, the United Kingdom and the United States from owning nuclear weapons and commits those states to eventually eliminating their atomic arsenals, pledges that have been ignored. Though not signatories to the treaty, Iraq, North Korea, Iran (and unofficially, Israel) have all developed nuclear weapons. However the resolution – adopted on December 23 – was foreshadowed by a tweet by President-elect Donald Trump on December 22 in which he stated: “United States must greatly strengthen and expand its nuclear capability until such time as the world comes to its senses regarding nukes”. Trump also mentioned that dismantling Obama’s long-negotiated Iran nuclear agreement was his “number one priority”. "This treaty will be negotiated with or without US support, so I don't see Trump having a significant impact," -- Beatrice Fihn, International Campaign to Abolish Nuclear Weapons. Some have seen these comments as an act of assertion aimed at strengthening his negotiating position upon arriving in the Oval Office, as Trump has already reversedhis position on issues to which he pledged support. Beatrice Fihn, director of the International Campaign to Abolish Nuclear Weapons has described these statements as ‘nuclear-sabre rattling’ and the challenge to implementing the treaty as imperative. Chief among the issues that would comprise a treaty is the Iranian nuclear deal, or Joint Comprehensive Plan of Action (JCPOA), a long-negotiated tool many on the Security Council are seeking to protect. Fihn and representatives from other non-proliferation organisations are awaiting clearer statements from Trump’s administration before establishing their strategies, an approach that may have worked when dealing with previous administrations but could face unprecedented difficulty today. Trump has spoken before about the value of being unpredictable when it comes to nuclear weapons as a means to keep other leaders, both friends and enemies, keen to appease. Unpredictability is also the hallmark of North Korea’s supreme leader Kim Jong-un. In his New Year’s address, Kim warned that North Korean engineers were in the “final stage” of preparing to test an intercontinental ballistic missile. Provoking a disbelieving response from Trump and more cautious tones from China and South Korea. The most recent attempt at a nonproliferation review treaty in 2015 was unsuccessful, largely because of the failure of efforts to engage Iran and Israel. Both countries still absorb a disproportionate amount of the efforts to implement a treaty. According to the findings of a congressional study into international arms sales that found that the sale of global arms dropped in 2015 to $80bn from 2014’s $89bn with the US responsible for around half of all sales. Over the next decade, the United States is expected to spend around half a trillion dollars on maintenance and upkeep of delivery systems of its nuclear weapons armoury, considerably larger than the Department of Defence claims is required to deter a nuclear attack. The conference is scheduled to run from March 27-31 and continue from June 15-July 7. Update: This article has been updated to more clearly state that the United States is not a signatory to the nuclear non-proliferation treaty and to reflect that since Iran is not a party to the treaty it is not violating it. Correction: an earlier version of the this article referred to Beatrice Kihn, International Campaign to Abolish Nuclear Weapons. It should have read Beatrice Fihn.